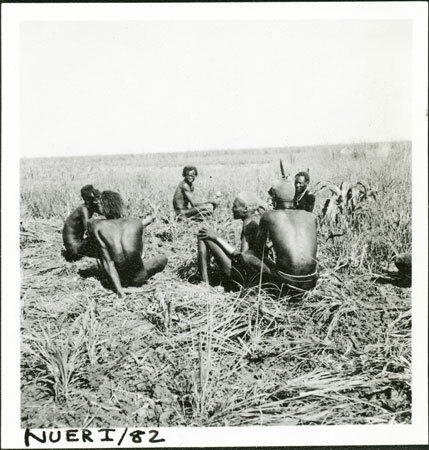 A group of at least six men sitting chatting in an area of cultivation near to Abwong village on the south bank of the Sobat River, probably preparing the ground for the first sowing of millet and maize. This fits well with the May-July period in which Evans-Pritchard's 1935 fieldwork was undertaken. Cultivation, along with fishing, was considered a subsidiary but necessary activity by the cattle keeping Nuer. Note on print reverse ms pencil - "28 2 A208" & print front border ms ink - "NUER I/82"
Morton, Chris. "Nuer men preparing garden" Southern Sudan Project (in development). 03 Jan. 2006. Pitt Rivers Museum. <http://southernsudan.prm.ox.ac.uk/details/1998.355.41.2/>.